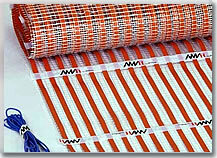 AHT FLAT RIBBON MAT� is a major advance in the field of underfloor heating systems. 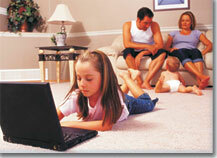 It is based	on innovative heating ribbon technology	developed by AHT. In this	technology, a unique Amorphous Metal Alloy replaces	traditional electrical heating elements,	achieving outstanding energy efficiency,	safety, flexible installation and	maintenance-free long life. The result is an	unobtrusive in-floor heating system that	provides quickly and evenly distributed	natural warmth, exactly where it is needed	in the home at any time. Indoor - Under-floor heating mats for:	tiles, stone, marble and ceramic, parquet, wood and carpets. Please refer to the AHT Heating Mat Installation Manual. © 2009 Orion Eco Tech All Rights Reserved.